It is all but a certainty that children will never believe that their parents were young once. The very thought of my mother and father having fun in bars or doing god knows what makes my head spin at the very thought of such bogus happenings. I thought of this while watching The Banger Sisters, a film in which two ex-groupies meet up after one has become prim and proper while the other still keeps up with the manic lifestyle of her younger days. No matter how unbelievable the premise (parents had fun once?) I found The Banger Sisters to be a mildly, if not vacant, piece of entertainment. In their younger days Suzette (Hawn) and Vinnie (Sarandon) were legendary rock groupies, nicknamed The Banger Sisters by Frank Zappa; they hung out with rock stars in the sixties and seventies and have the Polaroids to prove it. Flash forward to modern day where Vinnie is a successful mother whose husband dreams of politics, and two children who are spoiled beyond belief. Suzette still works at the bar in which she spent so many nights as a Banger Sister, that is until she is fired and faced with eviction. With no hope left she heads to Phoenix where on the way she picks up Harry (Rush), a failed screenwriter with the intention of killing his father. Upon her arrival in Phoenix, Suzette learns that Vinnie is not who she used to be, something Suzette desperately tries to repair. There is nothing particularly original about The Banger Sisters nor is there anything that could be considered more than simply humorous, but on the strength of the acting the movie surpasses mediocrity and becomes something more. First time director Bob Dolman (who also wrote the script) wisely allows his stars to take control of the film as he places Hawn in nearly every scene, which is a plus given that her performance gives the picture a delightful feel. Sarandon is in step with Hawn in terms of acting, but her role seems to have been too underwritten—she exists only to change. This would be fine, but there's no real build up to the pivotal moment where she rekindles her past. The largest fault to be found here is that it moves from scenario to scenario with no real flow. Dolman effectively includes nearly every requisite scene needed to build a stock dramedy, including the mandatory female bonding sequence set in a scenic location—here is occurs on a "Got Milk?" billboard. The Harry character is another flaw, as he seems to have no real purpose and feesl like an afterthought. For all of these flaws, though, The Banger Sisters is an enjoyable way to pass an hour and a half. 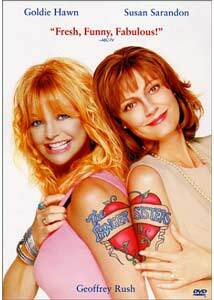 The performances are of high quality, with Hawn in particular handing in her finest performance in quite some time. Image Transfer Review: Presented in both full-frame and 2.35:1 anamorphic widescreen transfers The Banger Sisters DVD shows off the films bright colors with absolute delight. The transfers offers terrific sharpness and detail, though some scenes featuring the outside of Vinnie's home show a bit of softness. Colors are crisp and bold, especially in Suzette�s wild outfits as well as the blues of the numerous swimming pools. I noticed a small amount of pixelation, but nothing to knock the overall grade of the transfer down. Audio Transfer Review: The Dolby Digital 5.1 mix surprised me from the start with its nice use of the split surround speakers to add both ambience as well as back up the rock music soundtrack. The music is also very bass heavy with the .1 LFE track getting quite a nice workout. Dialogue is crisp and clear with no distortion. Extras Review: A feature-length commentary by Bob Dolman is the only substantial extra feature; thankfully, it is a nice track. Dolman is informative in describing what occurred during the short (a little over a month) as well as other numerous anecdotes about the making of the picture. I would have liked a little more about the original concept, but what is here is enough to make up for the absence. A short HBO special is featured, though it is largely promotional and only runs a little over ten minutes. Finally, the theatrical trailer as well as a blooper reel, which will cause a laugh or two for sure, are included. The theatrical trailer for Bend It Like Beckham is also offered. Some films, no matter how formulaic, are still enjoyable. The Banger Sisters falls into this category. The DVD is certainly high quality with above average video and audio portions, though the extra features are a bit weak. Overall a nice rental for a night spent inside.